According to the USDA, the typical American consumes a total of 150 lbs of sugar every year. This includes sugar in everything from candy to condiments. It’s already pretty obvious that sugar, especially heavily processed sugar, isn’t good for our bodies. Sadly, most Americans have a major sweet tooth. One of the most difficult things to give up when you start a new diet are sweet things. There is a never-ending search for sweet snacks that are low in calories, carbs, fat or whatever you are trying to avoid with your eating habits. The good news is that there are amazing sweet snacks you can make yourself or buy that aren’t going to totally mess up your diet (if you practice moderation) and are healthier options than a candy bar. Froyo is pretty much the perfect delicious alternative to ice cream. Greek yogurt in particular is very rich and healthy for you. Making your own frozen yogurt at home is fun and will definitely take care of your sweet craving. Practice moderation since many frozen yogurt brands are pretty high in sugar. Do your research and choose the most natural, low sugar brands. Also, consider frozen yogurt as a go to on cheat days instead of regular ice cream. Granola is not only delicious but also super healthy for you and can be very filling. It makes a great midday snack or a pick-me-up after a workout. The grains in granola help to stabilize your blood sugar due to it’s high fiber content and knock out that sugar craving. Look for brands that are low in sugar and baked instead of fried (check the fat content). 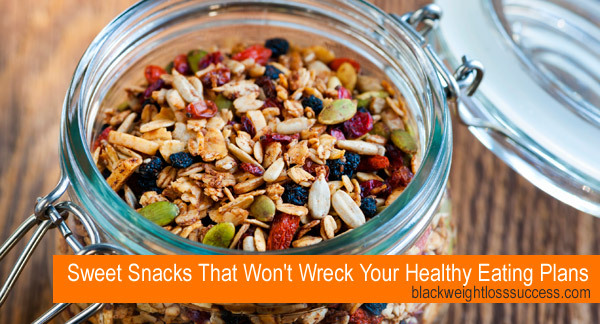 You can also make your own granola and granola bars. Sorbet is another delicious alternative to ice cream. If you love fruit, you’ll love sorbet. Sorbet is more of a light frozen treat and can be made from nearly anything. It’s also generally dairy-free. Make Your Own: Many store-bought sorbets are pretty high in sugar unlike the following recipes. Store-bought popsicles are shockingly high in artificial flavors and loaded with sugar. During the summer homemade popsicles are a great way to cool off and get a taste of something sweet, but you can eat them all year round You will need to buy popsicle molds but they are available in most any store like Walmart and are pretty cheap. Smoothes are super easy to make and can absolutely satisfy a craving for something sweet. All you need is a blender and your imagination. An added health benefit of smoothies is within the blending process itself. When the fruit and other ingredients are pulverized it allows your body to absorb the nutrients and fiber. Smoothies don’t really require a particular recipe but if you’re looking for something new to try, these recipes are delicious and healthy. Check out my green smoothie guide. Check out our free 14 day smoothie detox. One of the simplest yet decadent sweet snacks are chocolate dipped fruits. The trick to making chocolate dipped fruit healthier is swapping sugar-filled milk chocolate for a dark chocolate (70% is a good choice). Dark chocolate takes some getting used to but you’ll find that the more bitter chocolate is delicious when combined with sweet fruit. Chocolate-dipped strawberries are one of the most popular combinations. Simply melt down your chocolate slowly, in a double-boiler preferably, and wash your strawberries. Use the green of the strawberries to roll the berry in the chocolate. Once covered, you can either leave them like that or add toppings. Set the berries on a sheet of parchment paper and place in the fridge to let the chocolate cool and harden. Another amazing chocolate and fruit combo are dipped bananas. Bananas are an amazingly healthy fruit that is filled with potassium. To make these, prepare the chocolate the same way. Peel your bananas and cut in half, roll in the chocolate and place on parchment paper. Add toppings if you want, crushed walnuts and granola are especially good, and place in the freezer until hardened. As more Americans become aware of their health and the dangers of high sugar many food companies now have sugar-free lines of their products. While you can find diet-friendly sweet snacks in stores they usually instead have artificial sugar products so shop carefully. Homemade sweet snacks are fun to make and even more fun to taste test.